In this section, you will learn how to develop plugins, themes, and sites using the AMP plugin. You’ll walk through the different parts of the plugin as you learn about the development workflow and process. Let’s start with the AMP Settings page. This page provides you with different options for setting up AMP on the site. There are 3 Template Modes: Native, Paired, and Classic. To learn more about these modes, visit the this document. Developing while in Native or Paired mode will be the most useful. Both of these modes use the active theme and provide a more rich AMP experience. Developing in Classic mode helps with backwards compatibility with previous version of this plugin, but it does not use the main theme templates, does not support widgets, and it only supports posts, pages, and media. If you’re developing a theme, you can also add theme support programmatically. The AMP plugin validates the web page’s markup. When possible, it modifies the document and creates a fully valid AMP document. Some elements are converted into AMP components, e.g. <img> to <amp-img>. Invalid nodes, such as <script>, are stripped out. AMP provides a large library of components, but there are also some tags and attributes that it doesn’t allow. As a developer you need to identify the invalid nodes that are stripped out and then find the right components or functionality to replace each of them with. How do you know what is invalid? The Compatibility Tool provides you with the information you need to know about what the problem is and where it exists. Using this tool, you will be able to work through each of the problem areas. If a node needs to be replaced, you can then leverage the AMP Project’s library. Let’s review the two main admin pages in the Compatibility Tool and how you can use them. 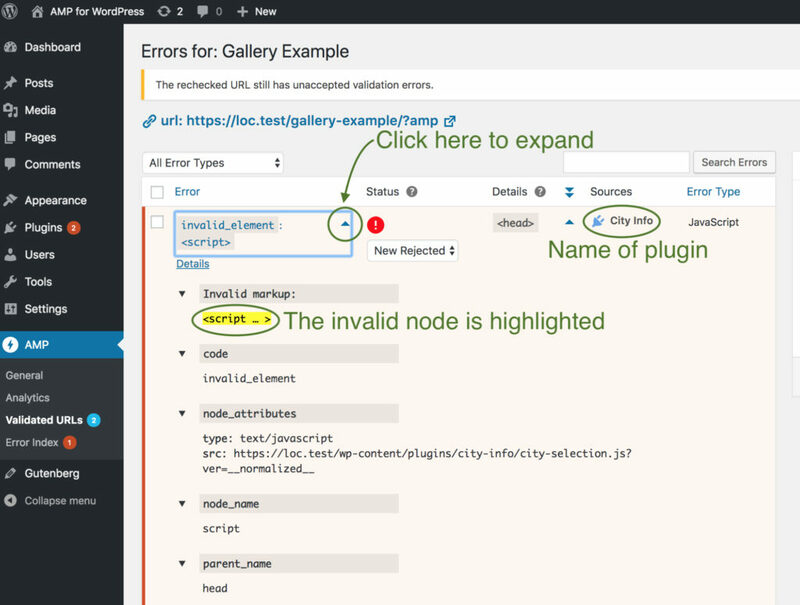 As you’re developing, you’ll want to know the types of validation errors. 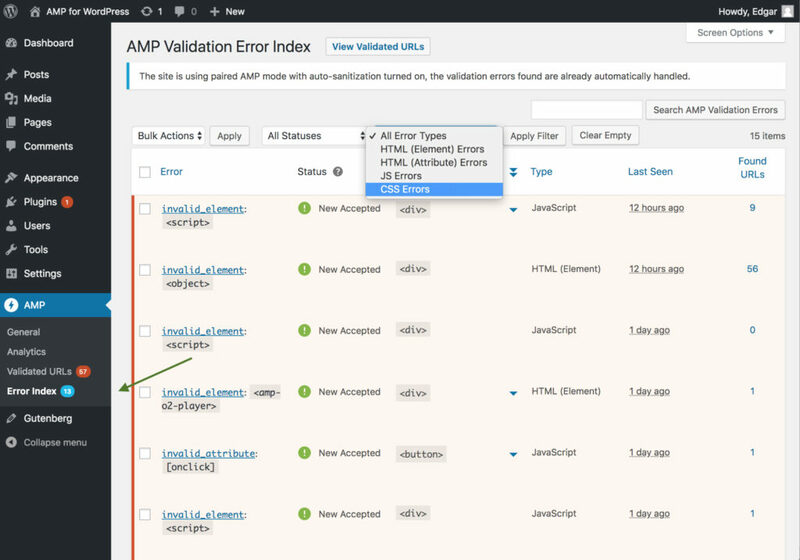 The AMP Validation Error Index page provides this information for you. You can view a list of errors. 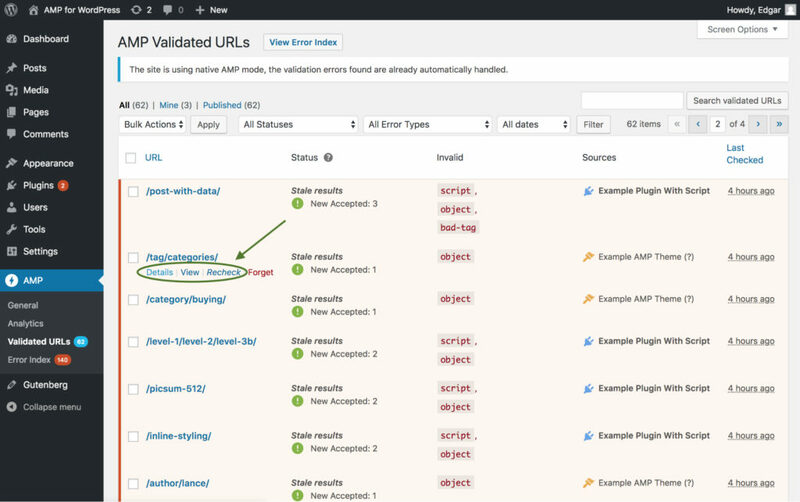 Then for each error, this index provides the error, status, type of error, when it was last seen, and the number of URLs where this error was found. This index page is highly useful for finding certain types of errors. 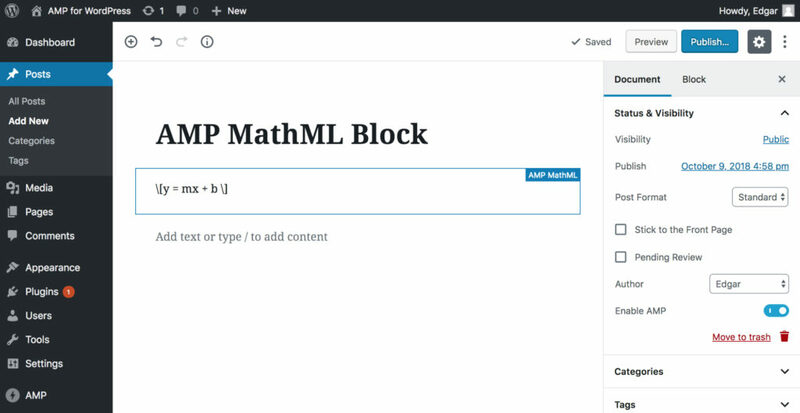 The AMP plugin will automatically convert certain elements to AMP components. This conversion does not cause a validation error. In most cases, there’s nothing you need to do, as the plugin automatically handles the conversion for you. One exception is creating forms that submit a POST request (see details below). The AMP plugin uses sanitizers to convert the elements to AMP. These sanitizers are found in includes/sanitizers/. They include allowed tags, audio, comments, embed, form, gallery, and more. Refer to the repository for a complete list of sanitizers. There are also sanitizers that convert almost all native WordPress embeds and shortcodes to AMP. Here’s the current support. In most cases, you won’t need to do anything to make these AMP-compatible. How about native WordPress functions? Best practice is to continue using these native functions. For example, you can use wp_get_attachment_image() and then let the plugin convert the <img> to an <amp-img>. Most native WordPress embeds are also automatically converted to AMP components. Including Facebook, Instagram, YouTube, and Vimeo. When there’s a form that submits via POST, i.e. <form method="post">, there are additional steps you’ll need to take. The amp-form script, as this plugin will do that when it finds a <form>. See the AMP documentation for more details. If your plugin doesn’t affect the front-end of the site, then there’s no concern for AMP compatibility. A good example is when your plugin is adding a custom taxonomy metabox to the editor. 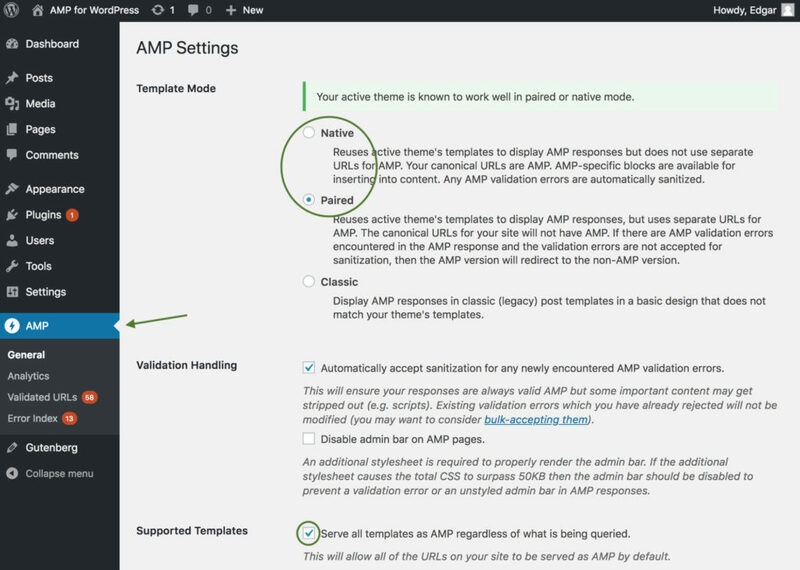 Let’s walk through the AMP validation process using an example plugin called City Info. You’ll learn how to make this plugin AMP-compatible. 4. Click in the “Error” column, and you’ll see the invalid node highlighted in yellow. This is a <script>. On other plugins you might see errors with amp-bind. * Whether this is an AMP endpoint. The <script> inside the AMP-state is very similar to the cities constant from the script above. But it uses JSON format, and it has a "selectedCity" value. We’ll look at that later. This creates a handler that will update the selectedCity value from the <amp-state>. For example, if the user changes the <select> to tokyo, the value of cityInfo.selectedCity will also change to tokyo. The src is the initial value, and the [src] can change dynamically. It’s important to set an initial value of the src, in addition to the dynamic [src]. Otherwise, there won’t be a src value on loading the page. 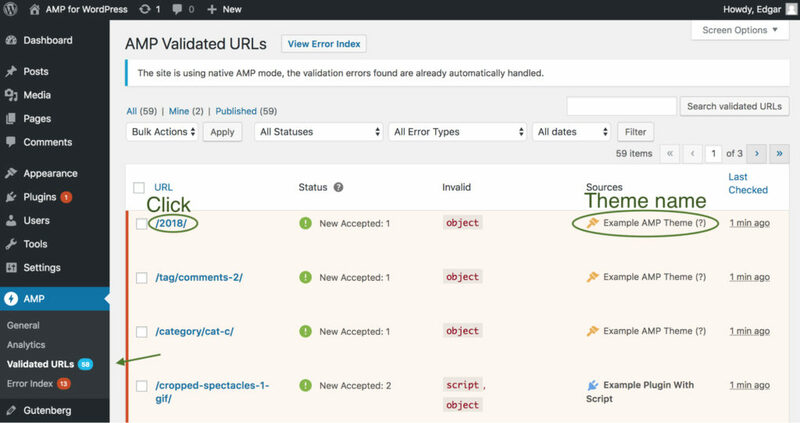 You can also let the plugin strip the <script> and report the validation error. The plugin’s users might have to accept the error, so that it doesn’t block AMP. See AMP Validation for more information about these statuses. But this only reports some of the possible errors. For this example City Info plugin, it won’t report the error until a widget is added. The plugin handles many AMP requirements for you, including most of the markup and metadata in the Creating your AMP HTML page. AMP requires scripts for https://cdn.ampproject.org/v0/amp-audio-0.1.js"></script>. But the plugin will automatically output the component scripts when it finds these elements in the document. You don’t need to do anything. The plugin handles much of the work for you for stylesheets and inline styles. 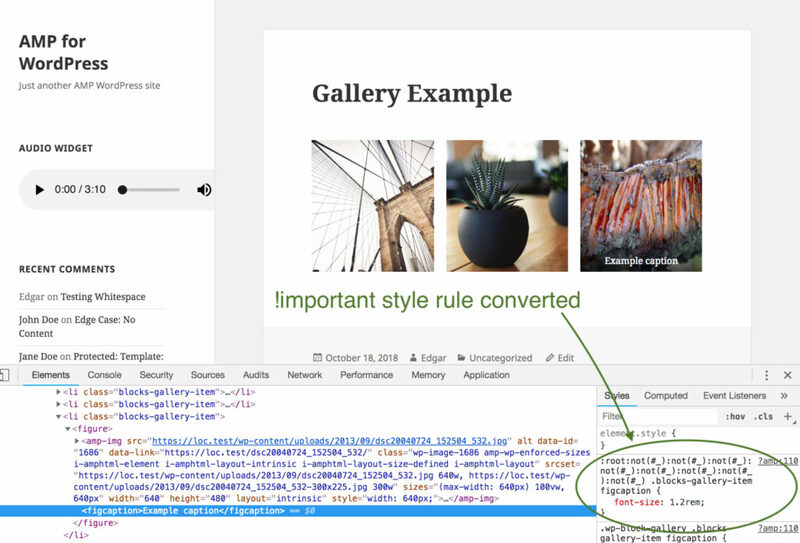 The AMP plugin lets you enqueue stylesheets using wp_enqueue_style(). It then prints the styles in the <style amp-custom>. AMP limits custom styles to 50KB. The AMP plugin performs CSS tree shaking for each URL to compare the markup to the needed styles. It removes unneeded styles, making it easier for you to get under that 50KB limit. Even with tree shaking, it is possible that a web page has more than 50KB of styling. If that happens, you will need to manually evaluate the page and reduce the styling. 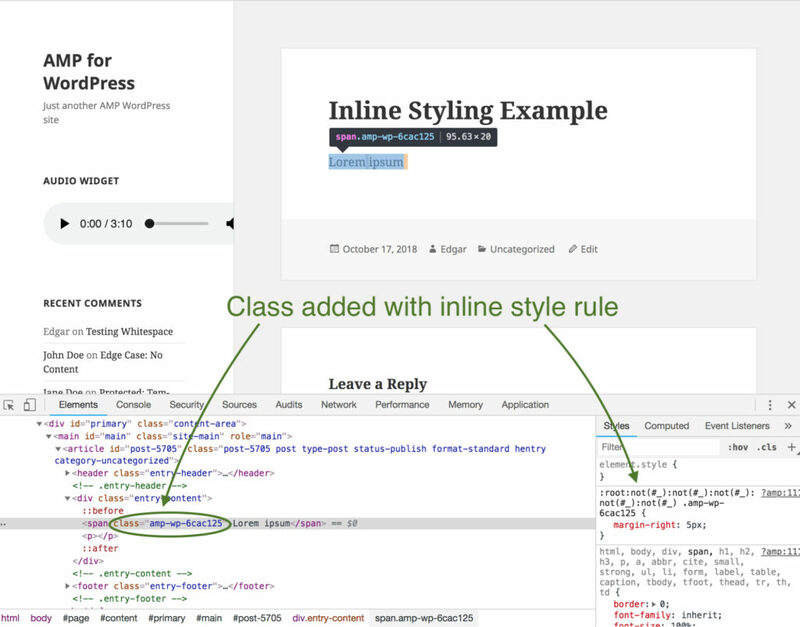 When there’s an inline style attribute, the plugin will create a class with the style rule and add it to the element. So you still won’t need to change anything, and there won’t be a validation error. You can use WP Rig to develop your theme, as it is AMP-ready. Otherwise, you can take the following steps, which are similar to those in WP Rig. This also requires taking steps 4 and 5 below. You can optionally register theme support for AMP with add_theme_support( ‘amp’ ), with optional arguments. 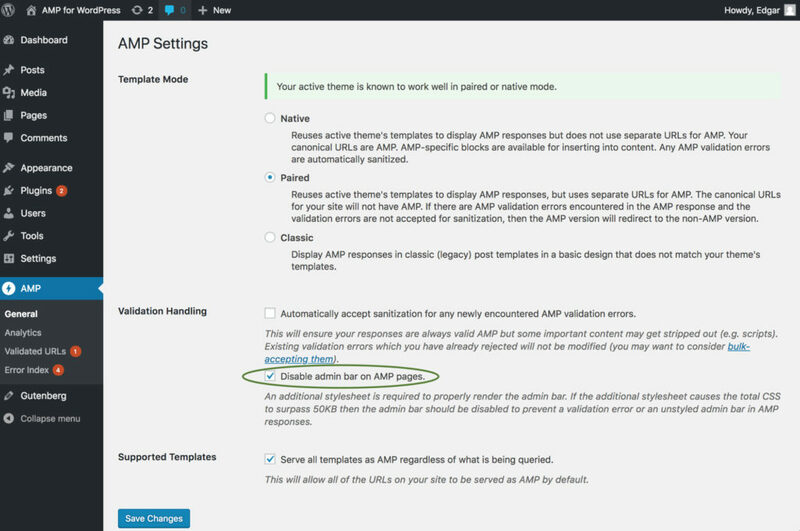 But this is required for amp-live-list support, along with the argument mentioned in Step 5. -list support, along with the argument mentioned in Step 5. Registering theme support programmatically is most useful if a theme is only intended for AMP. For example, if it uses AMP components like amp-carousel, you may want to force Native mode. Adding theme support will force Native or Paired mode, depending on the arguments array(), or lack thereof. Please see AMP Plugin Serving Strategies for more details on adding theme support, including the arguments array(). This enables the live-refreshing of comments from step #3 above. You also may want to develop blocks for AMP components. For example, this plugin has blocks for several media components, including amp-jwplayer and amp-ooyala-player. These will only work with AMP, so it’s best to only add them when in Native mode.